Through the power of prayer, the gift of the Holy Spirit, expository teaching preaching, the Matthews Memorial Baptist Church is committed to learning how to demonstrate the love of God in and through Jesus Christ so that we who are called by His Name will be equipped to: Glorify God, Exalt Christ, Edify People by Empowering them to be Kingdom-Building Disciples throughout The District of Columbia and the world for Christ! On June 5, 1921, under the leadership of Reverend John T. Marshall, former members of Bethlehem Baptist Church organized the Gospel Mission Baptist Church at the home of Carrie Minor. 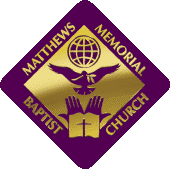 On July 17, 1921, the church chose the name, Matthews Memorial Baptist Church (MMBC) in honor of Reverend Joseph P. Matthews, deceased Pastor of Bethlehem Baptist Church. A year later, Matthews Memorial was recognized by the Ecclesiastical Council as a Missionary Baptist Church. The original church building was completed under the leadership of Reverend Marshall in 1932. Under the leadership of Reverend Roosevelt V. Coger, the mortgage on the first edifice was burned and all outstanding bills were paid; a new site was purchased for the church in 1959 and the congregation held its first service in 1960. In 1964, the MMBC Nursery School was licensed to serve the children of the members and the community. The Education Building was erected in 1977. Under the leadership of Reverend Dr. John H. Kearney, four ministers were ordained and two were licensed; a youth pastor was appointed; the Wendell P. Russell Scholarship Fund was instituted; the Leadership Training Institute was initiated and members completing eight hours of training, received an Evangelical Training Association (ETA) Certificate. My Sister’s House, an outreach ministry to provide services and resources to families of Matthews and the community, was dedicated and later was incorporated and received its 501© 3 nonprofit status; the Child Development Center (MMBC Nursery School) was accredited by the National Association for the Education of Young Children; a new sanctuary was erected and the laying of the cornerstone, ribbon-cutting ceremony and first service was held on Palm Sunday in March 1999. Matthews was designated a study site for the Interdenominational Theological Center (ITC) Extension Education Program, located in Atlanta, GA, which offered the Certificate in Theology. Nine members received their certificate; led a delegation of 44 to Senegal and Gambia, Africa. Under the leadership of Bishop Hudson, improvements were made to the infrastructure of properties, facilities and in safety and security both internally and externally; church finances were restructured from debt to asset, thereby reducing the monthly mortgage. The evangelism thrust was enhanced with weekly broadcast on Radio One – 104.1. Several ministers-in-training were licensed and four were ordained; instituted the Saturday Bible Class for men, the Mountain Moving Mighty Men of Matthews and Global Missions (outreach to Haiti and Africa); was instrumental in bringing to fruition a vision delayed for 24 years, to build senior housing, with the opening of Matthews Memorial Terrace in 2010. God continues to bless Matthews Memorial Baptist Church, as we take each step with the assurance that God is walking before us to lead and guide us.